I kept looking at my latest practice quilt sandwich and thinking what am I going to do with this now. It was approx a 19 inch square. It wasn't all that bad, maybe a few areas didn't look the best. Hmmm I tossed ideas around, my dear daughter was visiting and she would turn them done as quick as I would think of one. Finally an idea if I covered up the not so good areas maybe I could turn it into a pillow cover. I really could use some new ones. Next problem what to cover them with. I thought an applique would be perfect. At least I hoped it would. 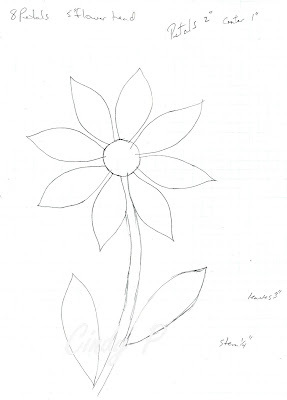 I drew out this flower and liked it. Next what fabrics to pull for the flowers. So I pulled out my odds and ends of scraps. I used steam a seam 2 lite. This was the first time I had used the new one, it worked great. I had some green bias stems leftover from another project. It was starting to come together, not too much so the FMQing that I liked still showed. I also had this butterfly leftover from another project and thought why not use it too. Still needed more so more flower petals cut and fused. Then on to some applique stitching I like using monopoly from superior threads especially on scraps. A few closeups of the flowers and stitching. Now I need a new pillow form to fill out my new cover. I trimmed it down but it is still too big for the pillows I have. Overall I like how I was able to re-purpose my quilt sandwich. What do you think? 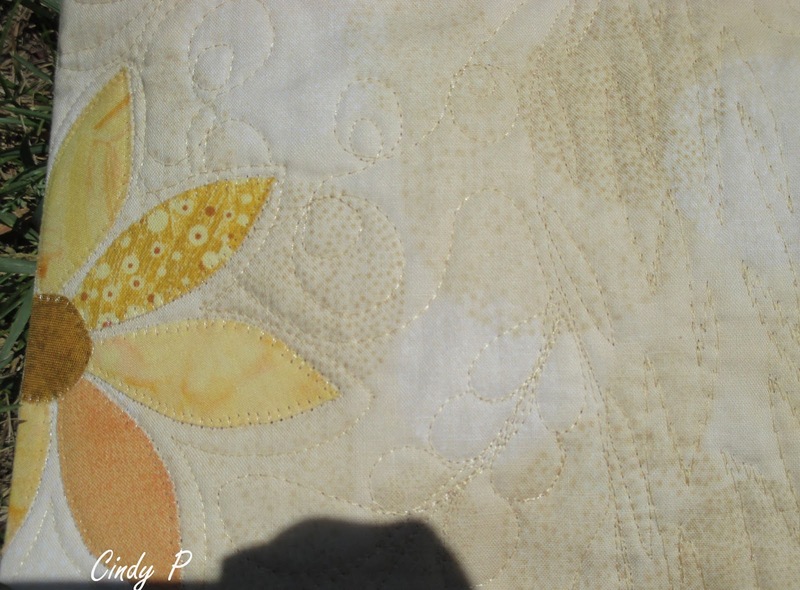 Have you ever re-purposed a quilt sandwich, or what do you do with them? OMG I just love what you did! I have re-purposed a couple quilt sandwiches, one is the mat on top of which sit Bella's (my cat) dishes, another under her faux sheepskin cushion, hmm I'm seeing a trend here, oh, and another as a sewing machine dust cover but it's not even sewn into one, just draped over the machine I inherited from my grandmother. Yours is so clever-- I love how some of the flowers come in from the side! The flowers are so pretty. I love that. I have never done anything like that but might someday. I really like your idea! I really love the fact you only have part of the flower showing on the edge!! I did repurpose one practice piece, I did feathers on it and an elderly friend thought it was the coolest, I bound it for a runner and gave it to her-she was delighted! 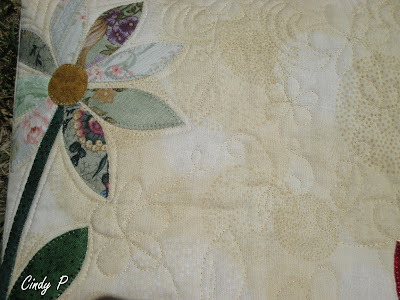 I love this flowers and quilting What a great idea to applique this beautiful flowers on the top. It will be a jewel in your room. Thanks for sharing. What a great idea for using your practice sandwiches. Maybe this will make me want to practice more. 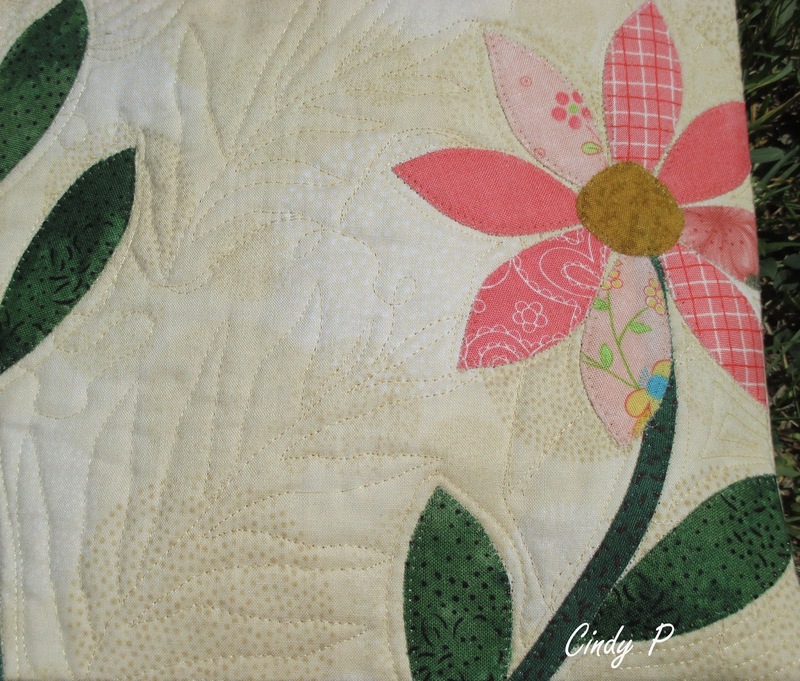 This is a great way to use your practice quilt sandwich... so pretty! I tend to just keep practicing on mine until they are useless messes. This is such a sweet cushion cover, Cindy! 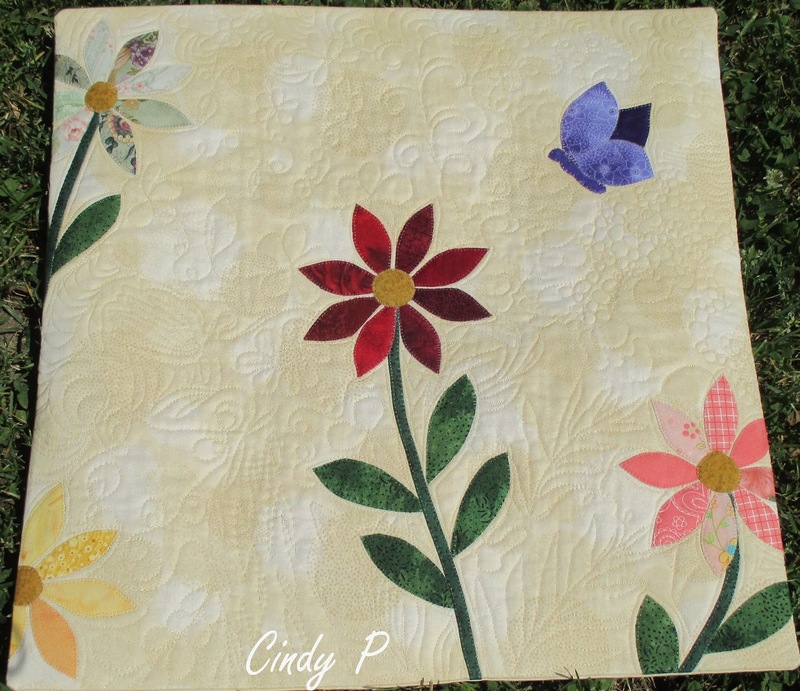 Love those appliqué flowers and the little butterfly. What a great idea! I haven't ever repurposed any of my practice pieces...never really thought of it. I really love what you did with your piece. I love the appliqued flowers and the butterfly. It's very pretty. Often I go over and over my quilt sandwiches until they really are a mess and then they sit in the bottom drawer! But I like your idea of doing what you did here and making it a worthwhile project - well done, it's lovely!! 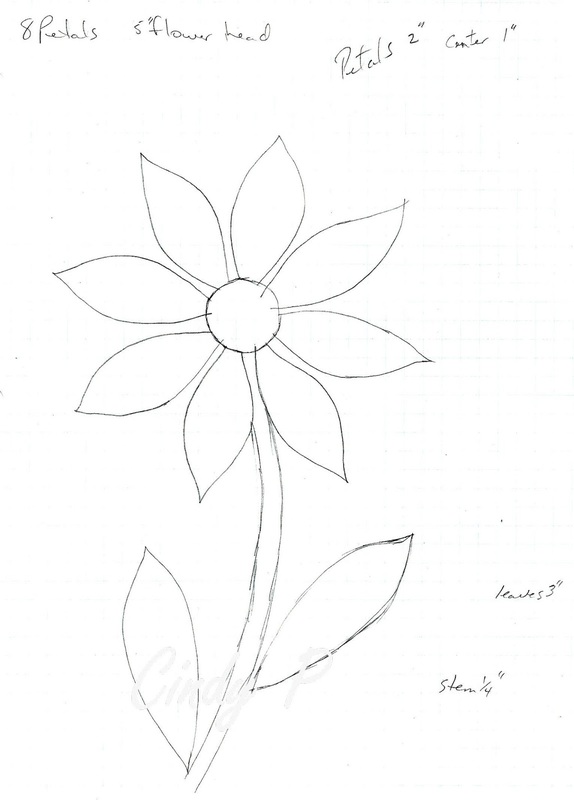 Your flowers are lovely - it is surprising how little tiny scraps can come to life if the shapes and colours are right. I would never have thought of doing appliqué after the quilting. The end result is perfect! 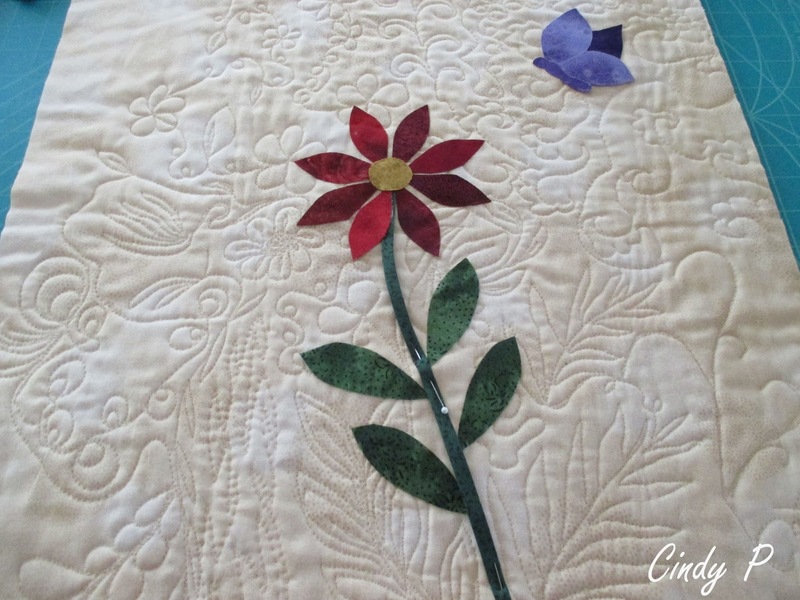 Thank you for visiting me... do come back again, and Happy Quilting!